Numerous teachings are available from the teachers listed below. Most of these recordings are in MP3 format. Copies of these recordings can be ordered from Kagyu Samye Dzong Cape Town. Your contribution supports the Centre in making these teachings available. 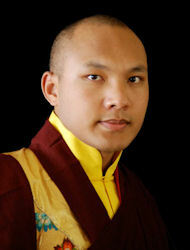 His Holiness, the 17th Gyalwa Karmapa, Orgyen Trinley Dorje, is the spiritual leader of the Karma Kagyu lineage. Born in Eastern Tibet on 26 June 1985, he was recognized at the age of seven through a prediction letter that had been written by his previous incarnation. His Eminence Tai Situpa and His Holiness the Dalai Lama confirmed the identification. In June 1992, he returned to Central Tibet and Tolung Tsurphu Monastery, the main seat of the previous Karmapas, where he was enthroned. In late 1999, in order to meet his teachers in India, the Karmapa left Tibet for India, where he traveled to see the Dalai Lama. Born in Eastern Tibet in 1954, the 12th Tai Situ Rinpoche left Tibet for Sikkim in 1960, where he was united with His Holiness the 16th Gyalwa Karmapa. 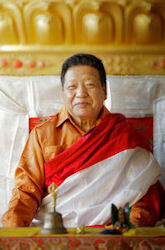 He established his monastery Palpung Sherab Ling in northern India in 1976. He has travelled widely – visiting North America, Europe, South-East Asia and New Zealand and lecturing on Buddhist philosophy and meditation. A renowned artist and calligrapher, Tai Situ Rinpoche speaks fluent English and is the author of several books in which he illuminates Buddhist teachings in commonsense terms using down-to-earth examples. He is currently involved in the advancement of inter-faith and inter-cultural humanitarian efforts and was the inspiration and motivator for the 1989 Pilgrimage for Active Peace. In addition, Rinpoche is the founder and Spiritual Head of the extensively enlarged Sherab Ling Monastery. Rinpoche was also involved with the recognition and enthronement of His Holiness, 17th Gyalwa Karmapa Ogyen Trinley Dorje. Chöje Akong Rinpoche was born in 1939 in Eastern Tibet and discovered as a tulku at the age of two. In addition to receiving spiritual and formal education, he also trained in traditional Tibetan medicine. As a teenager, he travelled from community to community, performing religious ceremonies and treating the sick. His spiritual training as a holder of the Kagyu lineage was completed under the guidance of His Holiness the 16th Gyalwa Karmapa. In 1959, he fled from Tibet to India, and a few years later, he and Chögyam Trungpa Rinpoche travelled to Oxford, where they learned English, and began to introduce the West to Tibetan religion and culture. This led to the foundation of the Kagyu Samye Ling Monastery and Tibetan Centre, in Scotland, the first Tibetan Buddhist Centre in the West. The current abbot of Samye Ling is Akong Rinpoche’s brother, the Ven. 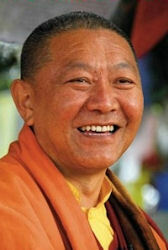 Lama Yeshe Losal Rinpoche. Akong Rinpoche is the head of the Samye Dzong Buddhist Centres in South Africa. Lama Yeshe Losal Rinpoche is the well-loved abbot of our mothership (and the oldest Tibetan Buddhist monastery in the West) – Samye Ling in Scotland. He has spent at least 20 years in various retreats, and was recognised by the former Kalu Rinpoche as one of the most highly attained meditators in the world. To be able to meet and meditate in his presence is a rare and precious opportunity. Born in 1943 in Kham, East Tibet, Lama Yeshe Losal Rinpoche escaped from Tibet as a teenager in 1959, arriving in India along with Akong Rinpoche, Chögyam Trungpa Rinpoche and a handful of other exhausted refugees. From 1967, he served as Private Secretary to His Holiness the 16th Gyalwa Karmapa at Rumtek Monastery in Sikkim, until leaving to join his brother Akong Tulku Rinpoche and Chögyam Trungpa Rinpoche at Samye Ling in Scotland two years later. After accompanying H.H. Karmapa on a tour of the United States, he and Lama Tenzin Chonyi established and managed the Karma Triyana Dharmacakra Centre in Woodstock New York, which is now H.H. Karmapa's main seat in the U.S. In 1980, he was ordained as a Gelong monk by H.H. Karmapa, before entering entered a strict, long-term solitary retreat under the guidance of the Abbot of Karma Triyana, Khenpo Karthar Rinpoche. He has also received teachings from many of the highest Kagyu Lamas, including H.H. the 16th Karmapa,and from The 12th Tai Situpa, Jamgon Kongtrul Rinpoche, Gyaltsap Rinpoche, and the Very Venerable Kalu Rinpoche. He has completed two 49-day Bardo retreats in total solitude and darkness. He has been instrumental in establishing a long-term Buddhist Retreat Centre and an Interfaith Centre for World Peace and Health on Holy Island, a small island off the coast of Scotland. Ringu Tulku Rinpoche is a Tibetan Buddhist Master of the Kagyu Order. He was trained in all schools of Tibetan Buddhism under many great masters, including HH the 16th Gyalwang Karmapa and HH Dilgo Khentse Rinpoche. He took his formal education at Namgyal Institute of Tibetology, Sikkim and Sampurnananda Sanskrit University, Varanasi, India and has served as Tibetan Textbook Writer and Professor of Tibetan Studies in Sikkim for 25 years. Since 1990, he has been travelling and teaching Buddhism and Meditation at Universities, Institutes and Buddhist Centers in Europe, USA, Canada, Australia and Asia. He also participates in various interfaith and Science and Buddhist dialogues. He authored several books on Buddhism as well as some children’s books both in Tibetan and European languages. 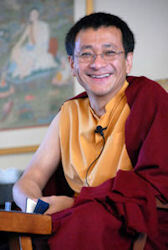 The founder and president of Nalandabodhi, Dzogchen Ponlop Rinpoche, is a leading Buddhist teacher in North America and an advocate of American and Western Buddhism. A lover of music, art and urban culture, Rinpoche is a poet, an avid photographer, an accomplished calligrapher and visual artist, as well as a prolific author. 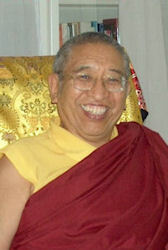 Rinpoche is fluent in English and well-versed in Western culture and technology. He is also the founder of Nitartha International, a non-profit educational corporation dedicated to preserving the contemplative literature of East Asia. The Venerable Khenchen Thrangu Rinpoche was born in Kham, Tibet in 1933, and was formally recognised at the age of five. He fled from Tibet to India in 1959, where he studied at Rumtek monastery in Sikkim, the seat in exile of His Holiness the 16th Gyalwa Karmapa, becoming the Abbot of Rumtek Monastery and being heavily involved in teaching. Since 1976, he has travelled extensively throughout Europe, Asia and the United States. Thrangu Rinpoche, a recognised master of Mahamudra meditation, has taught in over twenty-five countries and has seventeen centres in twelve countries. He is especially known for making complex teachings accessible to Western students. Because of his vast knowledge of the Dharma and his skill as a teacher, he was appointed by His Holiness the Dalai Lama to be the personal tutor for His Holiness the Seventeenth Karmapa. Chögyam Trungpa Rinpoche (28 February 1939 – 4 April 1987) was a Buddhist meditation master and holder of both the Kagyu and Nyingma lineages, the eleventh Trungpa tülku, a tertön, supreme abbot of the Surmang monasteries, scholar, teacher, poet, artist, and originator of a radical re-presentation of Shambhala vision. Lama Tsondru, who received monastic ordination in 1985, has received many teachings from important Masters like His Holiness the 16th Gyalwa Karmapa, Tai Situ Rinpoche, Gyaltsab Rinpoche, Khenchen Thrangu Rinpoche, His Holiness the 17th Karmapa Ogyen Trinley Dorje, Akong Tulku Rinpoche, Lama Yeshe Losal Rinpoche and many others. 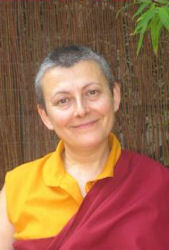 She has completed two 4-year retreats at Samye Ling in Scotland. With Lama Jinpa Gyamso she guides the Spanish centers connected with Kagyu Samye Ling monastery and the students currently committed to the first traditional retreat of Karma Kagyu lineage in Spain. In June 2000, in recognition of her dedication and hard work over many years, and her ability to benefit many people through her example and her teaching, she was granted the title of “Lama” by Akong Rinpoche. Lama Tsondru is well known and loved by her many friends and students for her warm, approachable, easy-to-understand teaching style, as well as for her dedication and hard work in serving the Kagyu Lineage and helping others. Lama Gelongma Zangmo first became a practising Buddhist when she arrived at Kagyu Samye Ling in 1977 and took refuge with His Holiness the 16th Karmapa. Having received teachings from many highly respected lamas who visited Kagyu Samye Ling, she completed several four-year closed retreats, during which time she became ordained as a Buddhist nun. 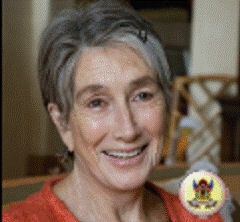 Since 1998, she has been helping with running the Kagyu Samye Dzong Centre in London. That year, she was one of a group of nuns who accompanied Lama Yeshe Losal to India, where she became fully ordained as a Gelongma (Bhikkuni) in Bodhgaya. This will in turn enable others to take full Gelongma ordination within the Tibetan Buddhist tradition in the future. Lama Zangmo's strong connection with Kagyu lineage and in particular with Choje Akong Tulku Rinpoche and Lama Yeshe Losal has inspired her to work tirelessly and joyfully in service to the Dharma and helping others. In recognition of her long experience, selfless qualities and commitment, she became the first person in the UK to be honoured with the title of Lama in June 2001. Rob Nairn is one of the pioneers in presenting Buddhist philosophy and practice in a way that is accessible to the Western mind. In 1980, he resigned as professor of criminology at the University of Cape Town to commit full-time to his spiritual path. His training in psychology and Buddhism – including a four-year isolation retreat at Samye Ling Tibetan Centre in Scotland – enables him to translate ancient Eastern wisdom into concepts we can understand and apply. Currently Rob is the representative of Dr Akong Tulku Rinpoche for Kagyu Africa: three Kagyu Buddhist centres in Cape Town, Johannesburg and Harare, as well as two retreat centres. 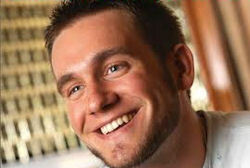 He spends half the year at the centres in Africa and half the year teaching in the United Kingdom and Europe. In the UK Rob is involved with the Mindfulness Scotland initiative together with National Health, and associate lecturer of the education faculty at Aberdeen University in Scotland, where he designed and founded the very popular three-year Master’s degree in Mindfulness. Rob is author of three books – all of which are popular in many languages and selling well in Africa, the USA, UK and Europe: Tranquil Mind – An introduction to Buddhism and meditation; Diamond Mind – Psychology of meditation; and Living Dreaming Dying – Wisdom of Tibetan psychology. 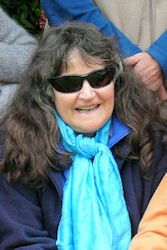 Beryl has practiced meditation for over 30 years and has completed a 6 month retreat. She is authorized to teach by His Eminence the 12th Kentin Tai Situpa. Charlie Morley, based in London, is a Lucid Dreaming teacher and practitioner of Tibetan Buddhism specialising in the use of both Western scientific and Tibetan Buddhist dream practices with the aims of bringing mindful awareness into all stages of dream, sleep and waking life. He is the co-creator of a new holistic approach to conscious sleeping and lucid dreaming called “Mindfulness of Dream and Sleep”. 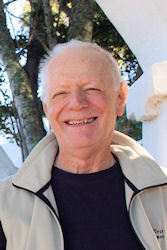 Charlie began to teach lucid dreaming within the context of Tibetan Buddhism in late 2008, at the personal request of his mentor and well-known meditation teacher Rob Nairn. He has also received the traditional Tibetan Buddhist “authorisation to teach” from Venerable Lama Yeshe Losal. Since then he has run numerous Lucid Dreaming and Mindfulness of Dream and Sleep workshops, courses and retreats around the UK, Europe, Brazil and USA as well as a bi-yearly tours of South Africa. Donal Creedon is a meditation teacher with many years experience, loved and deeply appreciated for his warmth, openness and sincerity. 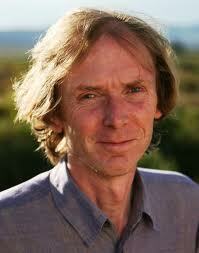 Donal has spent 12 years in retreat and was also a fellow of the Krishnamurti Foundation of India for 3 years. This allows him to balance a clear and thorough understanding of Tibetan Buddhism with the non-sectarian and uncomplicated teachings given by Krishnamurti, helping Donal to communicate the heart of Buddhist teachings beyond language and culture. Ken Holmes, born in London in 1947, travelled to India in 1970, where he spent some time in Dharamsala, studying with the monks and lamas around His Holiness the Dalai Lama. On his return to England, he went to Kagyu Samye Ling Monastery in Scotland, where he has been based for the past 36 years, devoting his life to making Tibetan Buddhist meditation and philosophy available to the Western world. He is currently Director of Studies at Kagyu Samye Ling. His life is spent teaching in Samye Dzongs in various countries, assisting Akong Rinpoche, writing and translating dharma works, and he also occasionally interprets for visiting Tibetan lamas. He has also lectured in elementology and astro-science for the Tara-Rokpa College of Tibetan Medicine. He was a founder member of the Scottish Inter Faith Council and has worked with the British Cabinet Office and the European Community on training programmes. He represented Buddhism at the seminal 2002 meetings in Brussels to discuss religious representation in the new European constitution. Ken has also developed and implemented a three year distance learning programme for the study of Buddhism. 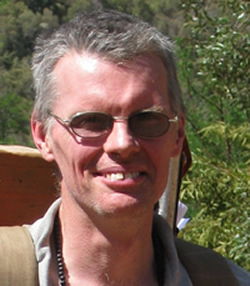 Ken and his French wife Katia are based at Samye Ling Tibetan Centre, Scotland, where he is Director of Studies. They both have been assisting Ven. Akong Rinpoche for about 40 years, translating Tibetan texts and interpreting for lamas. They both are much respected internationally for their inexhaustible knowledge of Tibetan Buddhism, which they impart with wisdom and clarity, humility and an infectious sense of humour. 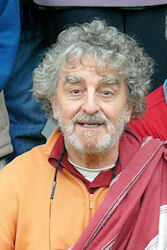 Alan Muller took refuge in 1997 with Akong Tulku Rinpoche. He has completed a one year and two six month closed retreats under the guidance of Lama Yeshe Rinpoche. Alan was also a monk for six years and has dedicated his time fully to Kagyu centres since 2000. Some of the teachers he has received teachings from are H.H. Dalai Lama, Thrangu Rinpoche, Tai Situpa Rinpoche, Minjur Rinpoche and Drupon Rinpoche. Jan Webster is a founding member and initiator of an innovative Non-Profit Organisation (NPO), ComaCARE, and has for many years been communicating and working with patients in comas. ComaCARE aims to change attitudes and care practice of those in extreme and altered states of consciousness, specialising in coma patients. 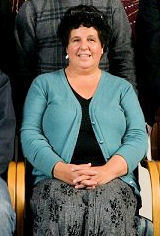 Jan is an organisation development consultant, trainer and coma care worker. She has worked with many NGOs, mainly in the field of mental health and human rights. Chodrak is a fully ordained monk in the Kagyu tradition of Tibetan Buddhism and has taken Gelong ordination with Tai Situ Rinpoche. He divides his time between the Tergar Institute in BodhGaya India where he is program co-coordinator for Mingyur Rinpoche, and teaching in South Africa, Germany and the United Kingdom. In the UK Chodrak also works for the National Health Service in mental health as a healthcare assistant. He presents mindfulness workshops for health professionals and runs his own Zen shiatsu therapy practice. Chodrak is is very knowledgeable in all rituals associated with the various practices and pujas. Chodrak studied and became proficient in the Tibetan language in a short time and was interpreter and attendant for Lama Thubten from 1983 until 1989. From 1989, Chodrak was on a four-year retreat at Samye Ling, part-time in position as chef to all the retreatants. In 1994, Chodrak visited South Africa as resident monk at the Cape Town Samye Dzong Centre, and also oversaw the Johannesburg, Port Elizabeth and Harare Centers. 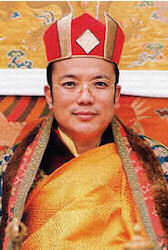 In 2000, Chodrak moved to Sherabling, Tai Situ Rinpoche's seat in northern India. Whilst living there for 4 years he became the secretary and translator for Mingyur Rinpoche. He also acted as translator on all of Mingyur Rinpoche's visits to the UK. 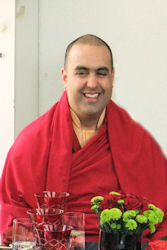 Born into a Buddhist family, Thubten was ordained in 1993. During his early years as a monk, he completed a total of 200 pairs of the Nyungney fasting practice in retreat. He has been able to receive teachings and transmissions from many of the greatest Kagyu Lamas. Later he travelled widely, teaching at Samye Dzong centres around the world, and he regularly served as Choje Akong Tulku Rinpoche's assistant on teaching tours. He has taught meditation as a method of stress management for business executives in top UK companies, as well as within the NHS, in prisons, and to addiction counselling services, local councils and social workers. 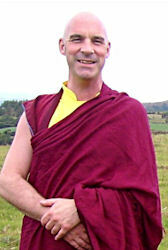 In June 2005, Gelong Thubten entered the first long retreat to take place at Samye Dechen Shing on the Isle of Arran. Ani Lhamo is a fully ordained Buddhist nun, who has completed a four-year cloistered retreat, and is an experienced teacher of meditation and Dharma courses. Currently working in adminstration at Samye Ling, as Lama Yeshe's secretary for the last seven years, she has learnt how to integrate the peace and stability of meditation into her busy, working life. Melanie is a psychotherapist, lecturer and teacher of Tibetan Buddhism, and has been empowered by Lama Yeshe Rinpoche to teach. She has worked and taught in a variety of fields with individuals and groups for the past 40 years. These include meditation, dream work, death and dying, bereavement, inner child work, relationships, karma and reincarnation, inner peace, discovering your true potential and many others. Melanie gives weekly Buddhist lectures at the Randburg Centre on Monday mornings and Tuesday evenings on many different dharma topics from how to clear our psychological karmic imprints to the deeper Vajrayana Buddhist teachings. She is also currently running a bardo training group once per month to prepare individuals for death and dying and to train people to assist others with death, dying and bereavement.